If you have anti-virus installed on your PC and wonder whether your anti-virus is working or not. What would you do to test the anti-virus software? Ask a programmer to write a virus to destroy your PC? No, you wouldn’t want any harm on your PC, just only want to test the anti-virus software. Fortunately, there is a test file that you can create by yourself to test your anti-virus without causing any damage to your PC. 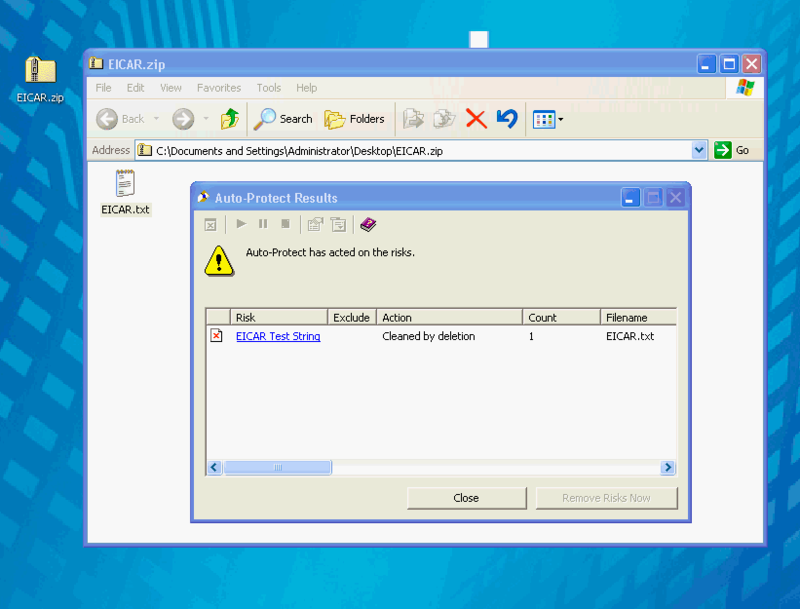 The file was provided by EICAR, which stands for European Institute for Computer Antivirus Research, called the EICAR test file. The anti-virus program will react with this file as the same as real virus but actually it is harmless. You can create by open your notepad and copy the below string to notepad and save as a new file. Then, try to save the file on your PC. If your anti-virus is running, it’ll alert that it has found a virus. In my computer, I have Norton AntiVirus and it alert me and delete the file immediately when I try to save a file with the string above. That’s means my anti-virus is still working. You can also test if the anti-virus software can scan compressed files by create this text file and zip it. In this example, I create the test file with that string and then zipped it on another PC that hasn’t anti-virus software installed so the file wasn’t deleted and then I copy to the PC which has Norton anti-virus installed. When I try to open the zipped file, it alert me that this file contains virus. Even if your anti-virus is working if you forget to update it regularly, it’s still risky that newer virus can harm your PC without detecting by the anti-virus. The good: Norton AntiVirus 2010 steps lightly on the CPU, while at the same time increasing in recent years, a detection system based on the reputation of a new behavioral detection. But are you wondering why these are free? Actually, these software applications have their pro versions that include more features, which they would actually want you to purchase. Anyway, there are many solid antivirus software applications. Here is some insight on just two of the best free antivirus softwareavailable these days. An antivirus software program detects, removes, and prevents the entry of computer viruses, trojan horses, and other malware. There are various types and brands of antivirus programs and all these use different strategies for the function.